Our friend Kjetil Haugan, the largest Galapagos Ecuador cruise operator so we hear a lot about Galapagos. A Recent article “Ecuador Regreens the Galápagos” in Wired by Julian Smith tells how the Ecuador government is protecting this special site. Here is an excerpt: The islands that inspired Charles Darwin’s theory of evolution are being loved to death. Every year, more than 140,000 tourists descend on the isolated archipelago to ogle its cactus-studded scenery and bizarre wildlife. And amid the blue-footed boobies and giant tortoises sits a handful of towns whose population has tripled to nearly 30,000 in the past two decades. To support all those people, 10 million gallons of diesel fuel and gasoline are shipped to the Galápagos annually, a fifth of which is used just to generate electricity. Regular tanker traffic in one of Earth’s most fragile ecosystems is a disaster waiting to happen (just ask an Alaskan), so the Ecuadoran government is trying to go green. Naturally, the remote location involves challenges, but several projects to cut fuel use and boost protections are up and running, with more in the works. After all, evolution takes time. The article tells about how the fuel-handling facility, formerly a mess of rusting tanks, is now one of the safest fuel depots in the Americas due to a $20 million rebuild, completed in 2004. The article outlines a wind power project on San Cristobal where three wind turbines were erected on the second-most- populous island. This meets half of San Cristóbal’s total power needs and a similar system is planned for Santa Cruz island. There is a solar-hybrid microgrid in Floreana where the electrical grid on this small island was reinforced with a solar array and rechargeable batteries to keep the lights on. PLus how biodiesel generators are coming. The Galápagos’ main airport is also getting a makeover with solar panels to meet a quarter of its power needs, a concrete runway that contributes less to heat-island effects than asphalt, and a terminal that captures the breeze for cooling. 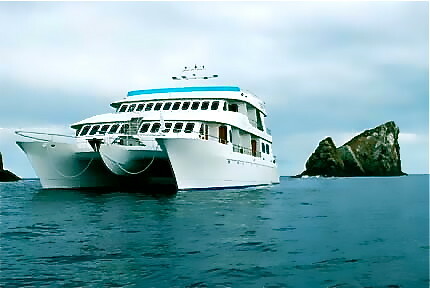 Let us know if you plan to take a Galapagos tour as we can often obtain a substantial savings for you. Kjetil’s company operates two vessels, the M/C Nina is one. 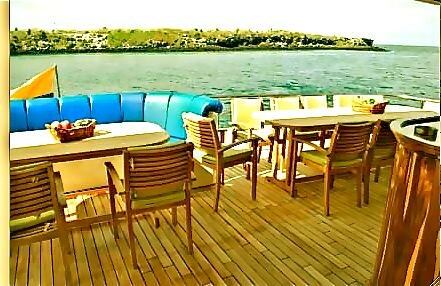 The Nina is also a 16 passenger luxury catamaran, with four main deck double or twin cabins, two single cabins and four upper deck double cabins, with a king size bed. 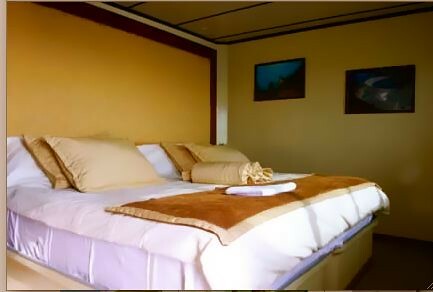 All the cabins have a private balcony and the windows can be opened, except for the single cabins that have sealed windows, but still have a little balcony. 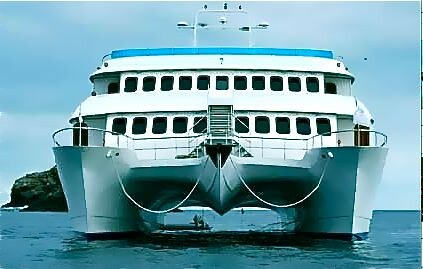 The Nina offers eight day cruises only and the normal cruise fee is $4,390 per person in a double cabin. However he offers Ecuador Living subscribers a substantial discount. Join us at a seminar or on a tour.